YUM! I can’t imagine that would be bad, but then you understand my obsession with the ketchup. I’ve never had straight up ketchup spaghetti, but my mom (and me too!) adds it to the spaghetti sauce she makes. And I tend to add ketchup on top of my spaghetti. There is no better food than ketchup spaghetti… although the shells are a fabulous pasta substitute… grandama D could make a feast out of ANYTHING!… and it was always good. This picture is making me crazy hungry! I’ve been eating Ketchup Spaghetti since I was 4 and I am now 54 and I have it at least once a week. Slightly more simple then you. All I do is boil some spaghetti and fry some ground beef. 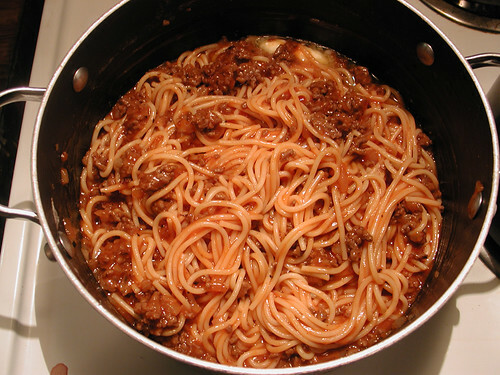 I serve myself the ground beef in a bowl and put my spaghetti on a place and pour ketchup all over it. Mix it in and voila. My version of ketchup spaghetti.